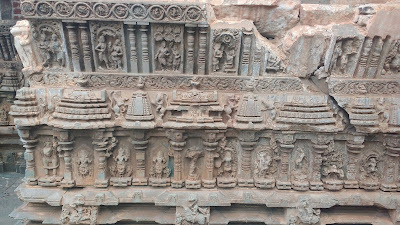 We sampled excellent specimens of the 'Gadag School Of Architecture' at Lakkundi. 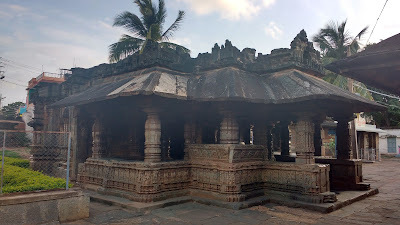 The capital of the Gadag district - Gadag city - also has a few artefacts from the same period. 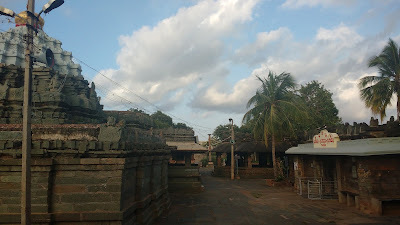 The monuments in Gadag city are located in well populated areas with narrow roads. We chose to walk; this would end up being a 3km route in the soft evening light. 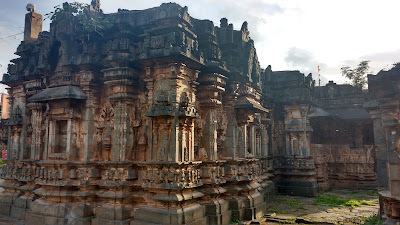 Gadag city is the headquarters for the Gadag district. 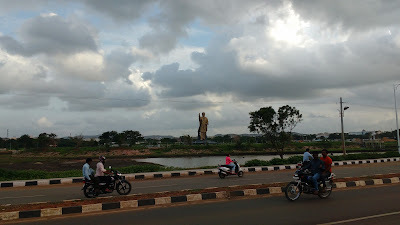 The city is well connected by road to various parts of Karnataka, and is about an hour's drive from Hubli, a major commercial centre. Railways connect the city of Gadag to all major areas of the country. 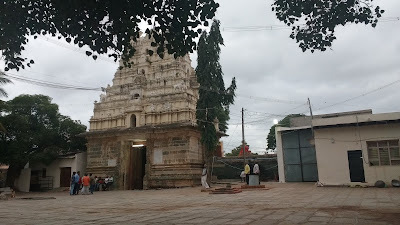 Considering the number of small tourist places that surround Gadag, the city could well be developed as a minor tourist hub. 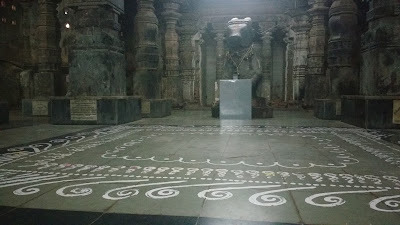 This complex has the temples of Trikuteshwara and Gayatri which are actively worshiped. 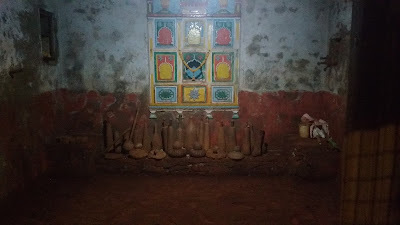 There are other minor shrines which are devoid of deities. 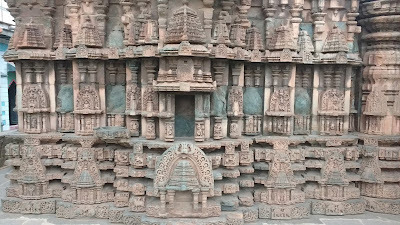 An intricately designed temple of Saraswati exists, but not in active worship. 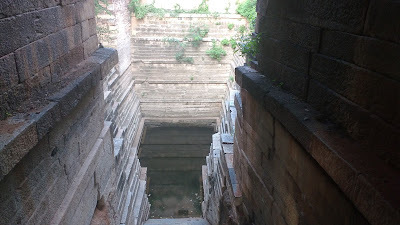 A step-well is also present. 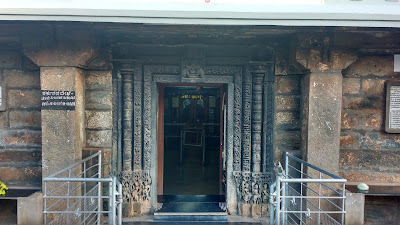 The Trikuteshwara Temple Complex has a few signboards in Devanagari script, while others are in Kannada script. It became a bit difficult to read the names of the temples and hence I consulted a security guard nearby. Actually, he was the only one in the complex. 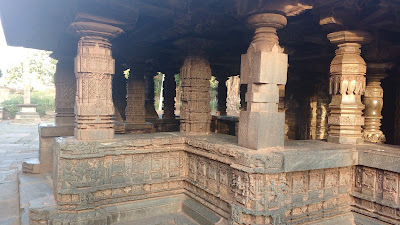 On his enquiring about my wherabouts, the initial discussion quickly dissolved into a quick tour of the shut-off places, followed by a introduction to a mapped guidebook of Gadag. He insisted that we 'had to' check out the hidden places of the district. I couldn't refuse. Priest: How do you feel about this place? Us: Its good, liked it very much. Thanks! Us: Can we take some photos inside? Priest: Yes, yes. Take photos as you want except the main deity. Tell me, you like this place? Does it have potential? Priest: But there is nothing outside, you see. When you go back, put these words in your Youtube video. Say that the temple is beautiful. You agree, right? But there is no development here! You have seen the roads. Its non-existent and littered. There has been no provision to develop the place. Please put this in your videos. We need more people to come here for the government to notice. Well, the responsibilities of a traveler are aplenty! 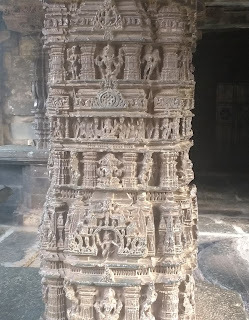 And yes, if any of the readers happen to be in Gadag, they would agree that the place needs some infrastructure support. The site itself is beautiful for sure! 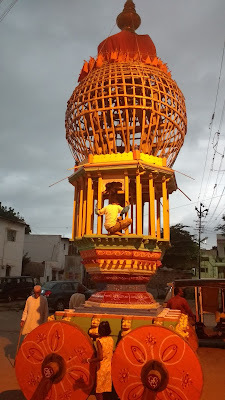 We stumbled across this Chalukyan structure while on our way to the Veeranarayana Temple and distracted by radio-drones. The temple is simple, yet beautiful. The temple is located in the centre of the complex, surrounded by a rectangular courtyard with Dravidian towered entrances and a gaushala. We saw a chariot here too. We made our way to the bus station through the Sarafa Market and then the regular markets. The Sarafa Market street boasts some old and beautiful buildings. I know how much these purohits want to convey to world through us. We do have a responsibility.